The AR Drone 1.0 shell is supplied without the electrics found in the full AR Drone 1.0 & 2.0 kits. You will need to add the PX4IOAR carrier and the PX4 FMU to the AR Drone Shell. The AR Drone 1.0 Shell includes all the parts needed to build up your drone and install the PX4 IOAR and PX4 FMU boards, This means that you don't need to remove the electronics supplied as standard in the AR Drone to install the PX4 boards. You will need to add a battery power cable, battery, RC receiver and a short receiver cable (servo cable) to complete the setup. Gear & Shaft Setlight and autopilot development. 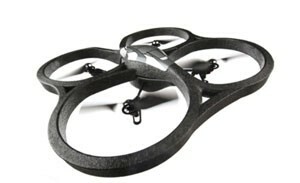 AR Drone is a trademark of Parrot SA, Paris. The PX4IOAR board is compatible to the AR.Drone 1.0 and 2.0 frame and motor controllers. PX4 is not affiliated to Parrot. PX4IOAR is not using any Parrot technology or software.